For a long time Japanese was taken to be a language lacking a subject-object asymmetry in subextraction. Two recent experimental studies have challenged this conclusion suggesting that Japanese complex NP (CNP) subjects are more opaque to subextraction than CNP objects (Jurka 2010; Jurka et al. 2011). 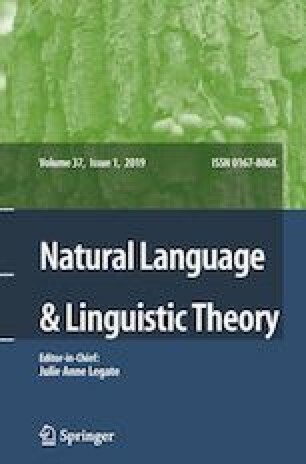 Given the significance of this claim for the cross-linguistic landscape of subextraction phenomena, this study further explores the nature of subextraction phenomena in Japanese with three acceptability judgment experiments. We show that overt subextraction (scrambling) out of CNP subjects and objects results in similar acceptability ratings once the relative weight and order of constituents are properly controlled for. Recent experimental work which suggested that Japanese has a subject-object asymmetry to subextraction predicted that wh-in-situ adjuncts should lead to greater degradation for subextraction out of subjects as compared to subextraction out of objects. To test this prediction, we also present novel experimental data on wh-in-situ phrases inside subjects and objects in Japanese. Our results show that the argument/adjunct status of wh-in-situ phrases does not interact with the subject/object status of the CNPs, further invalidating the recent claims. Together these findings support the traditional view that Japanese has no subject-object asymmetry in subextraction, whether overt or covert. Having restored the status of Japanese as a language with no subject-object asymmetry in subextraction, we discuss possible reasons that could account for the absence of such an asymmetry. We suggest that the lack of asymmetry is due to Japanese subjects’ inability to satisfy the EPP on T/C; we further contend that cross-linguistic variation in subject transparency follows from whether or not the feature D comes from subjects. The first author of this paper, Akira Omaki, passed away on August 6, 2018, following complications from lymphoma. Akira worked on this project while fighting cancer, until early June 2018, when he had to put his research activities on hold to focus on a new treatment. We feel honored and privileged to have been able to share this piece of research, one of Akira’s last, with him. We hope that those who knew Akira can see his passion, dedication, and professionalism in this paper. The online version of this article ( https://doi.org/10.1007/s11049-019-09449-8) contains supplementary material, which is available to authorized users. We would like to thank Ken Hiraiwa, Hideki Maki, and Hajime Ono, for allowing us to run our pilot studies and experiments with their students, and Ted Levin, Kamil Deen, and Julie Jiang for reading earlier drafts of this paper and providing us with valuable comments and suggestions. We are grateful to three anonymous reviewers, Caroline Heycock, and Julie Legate for their helpful suggestions and comments that greatly improved the content, organization and presentation of this paper. Many thanks are also due to the audiences at the 10th Workshop on Altaic Formal Linguistics (WAFL10) and the 8th Formal Approaches to Japanese Linguistics (FAJL8), where earlier versions of this study were presented. This work is an output of a research project implemented as part of the Basic Research Program at the National Research University Higher School of Economics (HSE). It was also supported in part by JSPS KAKENHI Grant Number JP17K02823 to Chizuru Nakao and NSF grant BCS-1619857 to Maria Polinsky. Kuznetsova, Alexandra, Per B. Brockhoff, and Rune H. B. Christensen. 2016. lmerTest: Tests in linear mixed effects models. R package version 2.0-30. Available at https://cran.r-project.org/web/packages/lmerTest/lmerTest.pdf.